After much consultation, discussion, debate, and prayer we have adopted ‘Becoming a Christ-like Community’ as our Parish Vision statement. This has emerged through a lengthy discernment process and incorporates the ideas we believe God placed on our hearts through the Partnership for Missional Church process and through Bishop Steven’s ‘Christ-like Church’ vision for the Diocese. As disciples of Jesus Christ we are called to follow in his footsteps, to be holy as he is holy, to do the kind of things he did: washing one another’s feet, healing the sick, proclaiming the kingdom of God, reaching out in love particularly to those who feel unloved and broken. We are called to do that in our community – not just within our churches, but throughout our parish. The PMC process has helped us realise that God is already at work beyond our church walls, and we are called to join in with all that he is doing out there. Having settled on the vision statement we now need to work out what that means for us in practice. A leaflet will soon be in our churches, which fleshes out in more detail what we think ‘Becoming a Christ-like Community’ means. In PMC language this is our ‘Vision for Embodiment’ or more simply, ‘putting our vision into practice’. The next step will then be to develop a ‘Long Range Plan’, drawing on all we have learned through the PMC process, and a Mission Group is being formed to help us turn the theory into practical action. Initially the Mission Group will work alongside the PMC Steering Team as the Long Range Plan is drawn up, and then they will take on the task of making it happen – or rather, helping us to make it happen! This is for the whole church throughout the parish, not just a few individuals – we are God’s people, Christ’s body, and we will only fulfil our calling by working together as God continues to lead us. So look out for the leaflet, and if you would like to be part of the Mission Group please speak to Catherine Radcliffe, Steve Jenkins or Penny Cuthbert. Alpha is a great way to explore questions of life and faith in a relaxed and informal setting. We eat together, watch a short dvd, then have an open discussion in which people can say anything, ask anything or just listen. No question is too simple or too hostile, and there is no pressure. This term an evening course is running at St John’s Vicarage on Tuesdays, 7.30-9.45pm beginning on 25th September, led by Sally Harlow and Penny Cuthbert. A daytime course is also running on Wednesday afternoons, fortnightly, 2.00-4.00pm, led by Helen Wernham and Mary Tucker at 50 Woodcote Road. Thousands of people have come to faith in Jesus through the Alpha course, and even those who remain atheists or agnostics almost always say they enjoyed the course and made friends. I wonder how you would define ‘worship’? What does it mean to you? What does a ‘good worship experience’ look and sound like to you? Choral Evensong? A reflective Taize service? Contemporary Worship with a band? Informal or formal? A silent retreat……..? This autumn we have embarked on a five-week sermon series focussing on worship – with a particular emphasis on the role of music in worship. The series is drawn from material in a booklet for small groups produced by the Royal School of Church Music, and all the small groups at St John’s are following the course this term, too. We all have different backgrounds, different experiences of life, different church histories, and different music tastes – so when we come together to worship God we may have completely different ideas about the ‘right’ way to worship. It is legitimate to have personal preferences, but every now and then it’s good to stop and think about what we are doing and why – and whether our worship is really God-focussed, or whether we are just doing the things WE like to do. Could there be something more for us to learn, fresh discoveries to make? My prayer is that over the next few weeks we will catch a fresh glimpse of the One, who alone is worthy of our praise, and find ourselves lost in wonder, love and praise! I hope we’ll be open to God, and to one another, as we think, share, pray and learn to worship together. 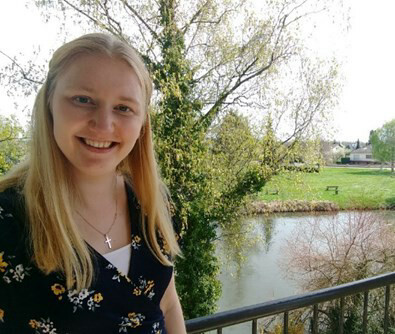 We’re pleased to announce that we have appointed Anna Clarke as our new part-time Children and Families Outreach Worker based at St John’s. Anna began work on 5 September and is looking forward to meeting everyone at St John’s. I currently live in Marlow but I am originally from Worcestershire. I am one of five children and love spending time with my family. I enjoy travelling and learning languages and have lived and worked for extended periods of time in five European countries. In my free time, I enjoy a variety of activities: playing netball, making handmade cards, playing guitar, games with friends, musical theatre, and most importantly, I am a big fan of Strictly Come Dancing! I have previously worked as a Children’s Worker for a church and also spent a year running a spiritual development programme for an impoverished community in Romania. I am really looking forward to the opportunity to get to know everyone at St John’s and to join together with the church family in discovering the exciting journey God has planned for us all! Join a team sharing the Good News in the community. we and the Methodists responded to that call. The team includes Anglicans, Methodists and more recently members of Riverside Church – truly ecumenical and welcoming. 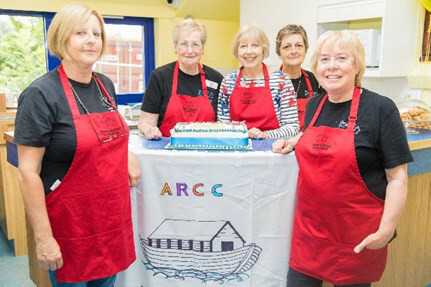 ARCC runs two-hour, Bible story-based, cooking and craft sessions on the third Sunday of every month at the Weller Centre. 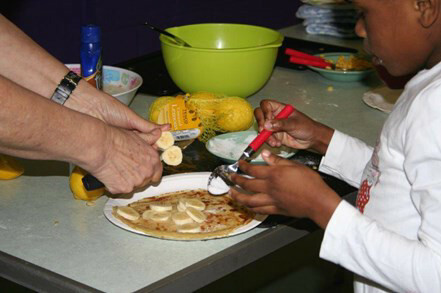 We cook food to share as a meal together at the end of the session. Craft activities are also themed together with a Bible story and prayers. You can be part of this Gospel-sharing work in the community. Contact Sue Jenkins via the parish office. On 21 September, we are inviting all our youngsters, year 6 and upwards, to a pizza evening. This will be in the Parish Rooms (next to St Peter’s Rectory), 7.30-9pm. The aim of the evening is partly to have fun, but also to put our heads together and come up with plans for a new parish youth group. Personal invitations have already been given out, or will be in the next few days, but don’t be shy: if you think you (or your child) should have had an invitation, but haven’t, do let us know. And if you have friends who might also be interested, ask us to send them an invitation too. We’re also keen to build up a strong team of adults and young leaders to develop the youth group, so if you think that this could be you, or you know someone who might be ideal for this, do also let us know.